WASHINGTON, DC – In a landmark decision, the US military has granted a decorated Sikh-American officer a long-term religious accommodation allowing him to continue serving while maintaining his articles of faith of keeping a beard and wearing a turban. 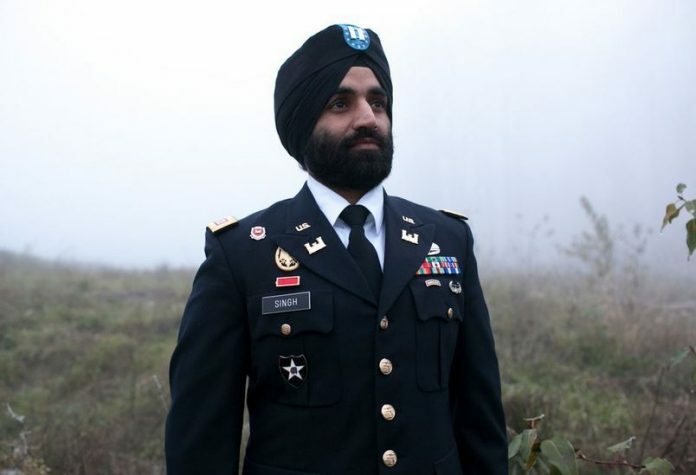 The move makes Captain Simratpal Singh, a 28-year-old decorated combat veteran, the first active duty Sikh soldier to receive approval to maintain his articles of faith while actively serving in the US Army. He had sued the Defense Department last month in a first of its kind lawsuit, saying he was being subjected to “discriminatory” testing because of his turban and beard. He said he was being asked to undergo additional testing for his helmet and gas mask. In a decision on March 31, the US military granted him the long-term religious accommodation allowing him to continue serving his country while maintaining his articles of faith of keeping a beard and wearing the turban. The Army granted the permanent accommodation, saying in a court document that it would only be revoked if the beard and turban affected “unit cohesion and morale, good order and discipline, health and safety”. “My military service continues to fulfill a lifelong dream,” said Captain Singh after receiving the decision in this regard from the US military. “My faith, like many of the soldiers I work with, is an integral part of who I am. I am thankful that I no longer have to make the choice between faith and service to our nation,” said Singh, who will now continue in his battalion operations staff position at Ft. Belvoir, Virginia. According to the The New York Times, Debra S Wada, the assistant secretary of the Army for manpower and reserve affairs, wrote in a memo to the captain that “Because of the Army”s strong interest in maintaining good order and discipline, the Army intends to develop clear, uniform standards applicable to soldiers who have received religious accommodation”. Until those standards are in place, Singh will be expected to appear in a “neat and conservative manner with a black or camouflage turban”, she said. The Sikh Coalition said Singh, who had graduated from West Point with honors in 2006, was forced to make the “untenable choice” between his religion and his career and had to cut his hair and shave his beard following failed attempts to obtain an accommodation. Singh, who successfully completed a Bronze Star tour in Afghanistan and received numerous other military accolades in various military positions, filed a religious accommodation request in October, 2015. The development has been welcomed by the Sikh-American community. “Captain Singh again proves to our military that the religiously mandated turban and beard do not hinder the ability to successfully serve,” said Sikh Coalition legal director Harsimran Kaur. “This decision gives hope that our nation”s largest employer is making progress towards ending a policy of religious discrimination,” she said. The Sikh Coalition filed another federal court lawsuit on March 29, which demands that the Army accommodate three Sikhs” articles of faith, including turbans, unshorn hair and beards, so that each can begin Basic Combat Training with their respective units in May, 2016. The lawsuit was filed after the US Department of Defense ignored a demand letter that was sent on March 23, and failed to provide decisions on their pending requests for accommodations. That litigation remains ongoing. “Captain Singh”s case is a painful study in the onerous hurdles for observant Sikh Americans who want to serve their country,” said McDermott Will & Emery partner Amandeep Sidhu. “With this historic accommodation, we hope that the US military will finally move past protracted, case-by-case religious accommodations and recognize that the time for permanent policy change is now,” he said. In November, 2015, 27 retired US Generals called on the US Department of Defense to eliminate the ban. This letter joins the 105 Members of Congress, 15 US Senators, and 21 national interfaith and civil rights organizations, who have previously signed letters in support of American Sikhs” right to serve. The Becket Fund, which also co-counseled in Captain Singh”s accommodation case, joins the mounting chorus demanding a policy reversal.